I think Bob’s brand has gotten big enough that I now see it in the larger chain grocery stores. I would think it is available in small towns by now. I’m excited to report that I live near the mill. I made it there for brunch recently with friends and basked in the grainy goodness that is the mill store. Aisles of their products from grains to beans to flours. The store is bright, new-feeling and well organized. About a third of the store is a bulk section (heaven!) and the overwhelming back area consists of the 25-50 pound bags of oats, cereals and more. I contemplated getting the 25 pound bag of quinoa or vital wheat gluten but decided against it. Maybe next time I’ll feel more ambitious. I had a Chinook Book coupon for 1/2 off something and I chose the 25 pound bag of muesli. I haven’t gotten tired of eating muesli, at least not yet. I like it because it’s great for camping, so I know we’ll use it. It’s a fun store, I should go there more often. 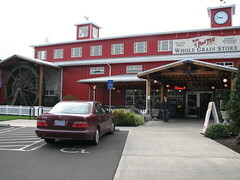 It’s located in Milwaukie, about 9 miles south of Portland. It is a dangerous place, so be careful. I don’t mean in terms of personal safety, more so in terms of impulse buying. I ended up getting some beans and millet and would have bought more if I was there any longer. I know Bob’s products and I like them. Some things tend to be pricey, but now that I live in Oregon, I’m supporting the local economy. I can use that excuse to justify my vital wheat gluten. But brunch! That is the whole point of the post. I was excited to find out they have a completely separate menu for vegetarians and vegans. No more skimming through 3 pages to find the one vegan option. A whole menu to peruse. I usually find it overwhelming when there’s a vegetarian menu because it’s too many options for me. I’ve gotten used to having 2, maybe 3 veggie options on a menu while eating out and more than that is a wonderful thing, but does overwhelm me. I can’t decide easily because I want to try it all. I ordered the vegan flapjacks with maple syrup and sausage. It was a lot of food and I was full pretty quickly. The flapjacks tasted like the flour was a whole grain mix, not just your typical fluffy AP flour pancakes. They tasted earthy, but I think that is to be expected from a mill. 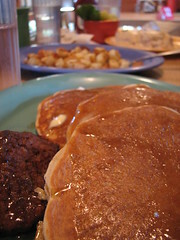 I enjoyed them and wished I had a double shot of the maple syrup because the flapjacks soaked up the syrup easily. It was nice to have a little container of Earth Balance to spread on it. The veggie sausage was average, not amazing but not crap. I never was into real sausage back in the day, so I’m not crazy over the vegan versions either. I’d rather have a seitan dog or have it cooked any other way than a patty. I find it kind of boring. My husband is a biscuits and gravy addict. So far my favorite recipe is from VWAV. Hands down it’s the best out there. But when we’re not home and eating out, the brunch food of choice for him is always biscuits and gravy. It’s listed on the menu as vegetarian, so it’s not vegan. The biscuits have buttermilk and butter in them and the gravy has milk in it. It would be nice if they could offer it as vegan, because those ingredients are NOT hard to substitute. Especially if they are already offering Earth Balance as the butter to go with the flapjacks. 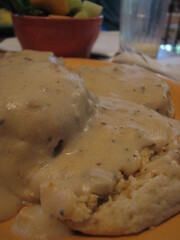 But don’t feel like you are missing out, they are not amazing biscuits and gravy. The gravy tasted like it was mostly flour based and the biscuits were really sweet, I’m not sure why. I’m sure they’d start offering it vegan if people filled out comment cards and they thought there was a need for it. I filled out mine, we’ll see what happens. Demand does affect supply. Overall, it was a great visit and I’d go there again. I’d like to try their vegan French toast or the tofu scramble next time. It felt like a fun field trip with no chaperones. Eat, sample and enjoy the bulk section. Sounds like a good morning to me. I love Bob’s Red Mill store! The bulk section is definitely addicting; it’s like picking berries, you just can’t stop wanting more. Did you see the small rack near the back of the store (by all the huge 20+ bags of stuff) that had $1 items that were slightly irregular? Super deals there. Fun! Now I need to go there again.